It’s nearly impossible to have a bad time at a karaoke party. Karaoke allows everyone to share their love for music and pay tribute to songs long forgotten. Kids love karaoke, too. They might love karaoke more than adults. A karaoke machine can amuse a child for countless hours. And if you have some earplugs, they won’t annoy you for all those hours! Most karaoke machines take CD+G discs. These are discs that look like normal music CDs, but they also hold graphics. The graphics display the song lyrics on a screen. The screen is either on the machine itself or can be a television hooked up with an A/V cable. Modern machines have other ways of streaming music but CD+G discs are the standard. What your kids need from a karaoke machine will vary wildly depending on their ages. Younger children will require something portable and battery operated. They’ll be able to roam around singing free from wires and cords. As they get older, children read better and know more music. They will want access to an increasing number of songs. Kids of all ages need some basics in their karaoke machines. The machine needs to be able to actually amplify sound. It needs to be able to take more than just CD+Gs, as well. Your CD+G collection will never be extensive enough for your older children. Your younger children will struggle with handling the CD+G discs. They will most likely speed up the natural wear and tear process of the fragile discs. To combat this, your karaoke machine should have an auxiliary jack. This will allow you to attach any device that has a headphone jack. Bluetooth is a bonus. Then your song options are endless. Two microphone jacks are essential for duets and group singing. 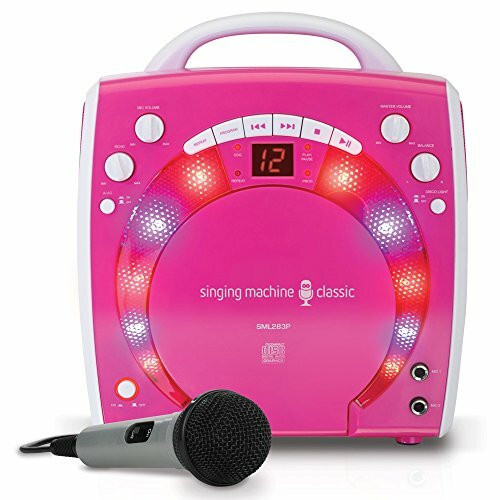 The Singing Machine SML-283P is a great karaoke machine for kids of all ages. Adults will enjoy it too! It has lots of great features especially great for kids. It can run on batteries, so your toddlers can haul it around. But it also has a mom-friendly plug option to save your battery budget. A thick handle makes it even more portable. It is lightweight yet durable, so let the little guys bang it around a bit while they dance! As for design, Singing Machine went pretty kid-friendly with this one. It has bright, colorful lights, which is fun for everyone! A bright pink option is sure to thrill many little girls. Don't worry. A gender-neutral black option will please everyone else. The buttons are big, bright, and simple to operate. Even young children should be able to switch between songs, play, and pause, and adjust the volume. Two microphone jacks allow your kids to share the spotlight. Only one microphone is included. This machine is great because it is also great for adults. It hooks up to the TV easily with included wires. You can also use the auxiliary jack to access the plethora of karaoke available on the internet. One feature of the product that can be either a plus or a minus is that it is not very loud on its own. Parents might enjoy this, as the kids won’t be too loud, but it might get annoying for some. However, this is easily remedied. When the audio runs through the TV, the TV is in control of the volume and it can go as loud as you want. For kids, this hits most of the criteria. It is easy for kids to tote around, and doesn’t get too loud, so the parents can enjoy some semblance of peace. The option to use batteries or an electric plug is perfect for parents. An added bonus is the voice effects. Echo is included, which makes everyone sound better. It covers mistakes and any instances of being off-key. Balance allows the user to adjust the volume of the music and the microphone. Singers who are very quiet will be boosted in volume. Meanwhile, the music will get louder to match any loud vocalists. Auto voice correction is especially nice for children. It needs a special kind of multitrack disc. On a multitrack disc, the vocals are included, but they are silenced when the singer is singing. When the singer stops singing, the vocals return to bridge the gap. It can help your kids learn lyrics. The auxiliary jack allows you play music from any device through the machine. While this allows you to access any song on the internet, it is not seamless. It does not transmit the visuals through to your television, only the audio. So if you’re using your phone or computer, you will have to read the lyrics from the little screen. This is even if you put the music through to the TV or karaoke machine. Overall, the Singing Machine SML-283P covers the basics really well. It does the minimum it needs to do, plus some fun little added features for the kids. It doesn’t go above and beyond, but for the price, that is not to be expected. It is a great toy, and at the price, it’s one of the best karaoke machines for kids.